Alleys are valuable public property that belongs to all of the citizens of Hamilton. They have great potential as part of a transportation network. We only need to clean them up and use them. On September 4, an RTH article by Liz Duval and Walter Furlan called for proposals to rehabilitate the alley north of Barton Street to be sensitive to current uses of this alley. This is a great idea, so the purpose of this article is to document some of these current uses. For example, there is at least one business, Gibson Bakery, whose retail entrance is onto the alley between Sherman Avenue and Earl Street. Interestingly enough, this bakery is located at the intersection of two alleys, with another North/South alley running directly behind it. I suspect that the owners of this business would strongly support an alley rehabilitation project that would result in more customers riding by. A major category of current users of the ally/park system are pedestrians and cyclists who already use it for transportation right now. Based upon the totally unscientific sample size of "the people I see when I am there," there are a large number of people currently using this system for transportation. The five connecting North/South allies also get heavy use as this total transportation network is used by people to get from A to B.
North/South travel demand through Woodlands Park to get to the paved cycling path is vividly shown by the desire path running through the park. Unfortunately, I was unable to find one use mentioned in the Duval & Furlan article. That was where they wrote that: "...the wild thistle growing unnoticed behind our studio in the alley on Barton attracts bees, monarch butterflies and finches." That sounded intriguing to me, so I went on a thistle hunt. It was easy to find the back side of the studio at 767-769 Barton Street. A sign advertising their business had been mounted on the shed there. However, I was unable to find any trace of thistle. Perhaps thistle once was there, but right now the area behind the studio in the alley is, alas, quite thistle-free and light in vegetation. If anyone is interested in supporting vegetation that attracts pollinators such as bees and butterflies, I would commend the fourth option for Barton Street in my previous article. This option is a conventional protected cycle lane, with flowerbeds being used for the protective barrier. For an example, see this video on the reconstruction of St Jacobsstraat in Utrecht, Netherlands. This provides for a large amount of flowers, milkweed and other pollinator-attractive plants. 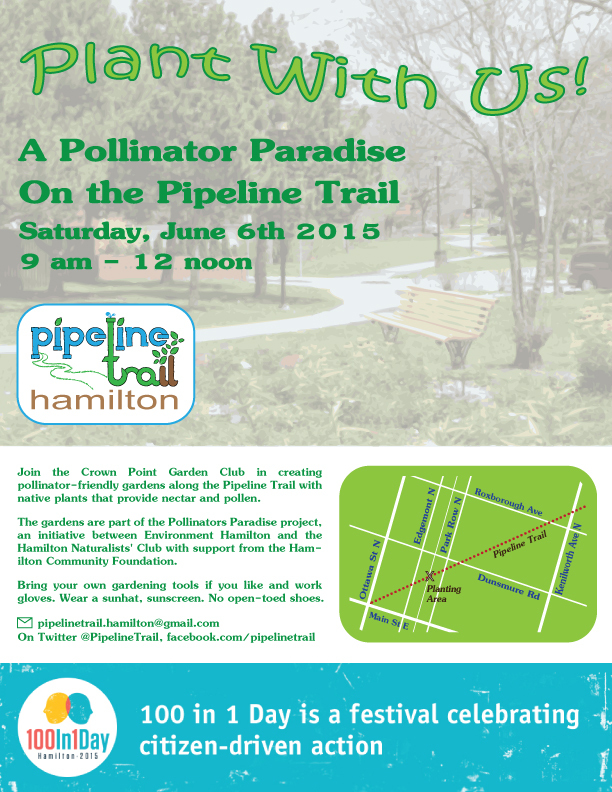 The City of Hamilton has existing projects for pollinator-attractive plants. One of these projects is in the right-of-way for The Pipeline Trail. This also provides for a far, far greater amount of pollinator attractive plants than the comparatively much smaller amount of vegetation in the Barton alley. This is not meant to be an assertion that rehabilitating the alley is the final solution for transportation on Barton Street. The alley network does allow people to get from A to B for a large number of destinations on Barton from Wentworth to Lottridge Street. But additional infrastructure is needed for the rest of Barton Street. These alleys are valuable public property that belongs to all of the citizens of Hamilton. I believe that they have great potential as part of a transportation network. We only need to clean them up and use them. You can see the Furlan Conservation sign on the shed in the background. Duval and Furlan wrote, "There were many more [thistles, but] they are illegal and the City cuts them down. In fact [our] neighbour had some and was issued an order to cut them down." I think a good start would be to name the alleys and provide signage at the main streets and at the entrance/intersection of each alley. The next step might be lighting. Looking at the photo of intersection with the bakery I can picture that building covered in a mural with a picnic table/bench outside and a bike rack. It would be neat little car free (for the most part) hangout. i'm pretty sure that bakery has shut down. Last I heard it's open. Check store hours; many businesses shut down early (at the moment) in this area of town. Last Friday afternoon I bought bread there. Delicious! Interestingly, way back in 1987 the Durand Neighbourhood Association sponsored a study of possible upgrading and beautification of neighbourhood alleys by a graduate student. The idea was precisely to evaluate the potential of alleyways to form a sort of greenway network that would provide a more comfortable and convenient way for pedestrians and cyclists to get around. In 1992, the Durand Neighbourhood Plan Implementation committee recommended a pilot project to improve the safety, appearance and use of selected alleys north of Duke Street. Unfortunately, nothing came of these initiatives. More recently, in 2009 the City was considering encouraging adjacent residents and business owners to purchase and close the alleyways as a way of reducing maintenance and liability costs for the City. Would you support a proactive City initiated approach to closing and disposing of alleyways to abutting owners, where practicable OR do you support the current method of alleyway closures based on a process initiated by abutting property owners? I'm not sure whether the privatization of alleys is still being promoted by the City. Emma Cubitt is an architect at Invizij Architects in Hamilton. In 2008, as an architecture masters student, she wrote a thesis entitled Laneway Infill: Re-Creating an Urban Housing Typology that looked specifically at alleyways in Hamilton. Doing a write-up on this paper for RTH has been on my embarrassingly long todo list for the past couple of years. We already have an example of this: Evans Street. The alley was upgraded, given a name, street lighting, etc. Check out the link. Looks good! We also have Fanning Street in Kirkendall behind Locke Street, and Wheeler Lane in Durand, half a block south of Bold between Hess and Caroline. I'd prefer to see the road portion much narrower and the sidewalk on the same grade as the road. They basically turned that into a full blown road. Very interesting. As a Durand resident, I use the fairly comprehensive Durand alley system all the time. I should take photographs and show how they connect A to B for a fairly large number of As and Bs. I use to live above the former Hendry's shoes on Barton, behind Gibson's bakery. That was 20 years ago and the alley was often used by cyclists. I like the idea of making it a designated route. Plenty of alleys from Barton to Cannon east of Gage that could be rehabbed as north-south cycle tracks. Lighting is a major problem, though.